Usually, when a restaurant interior is adorned with arcane, antique-y-looking cookware, the items in question are a symbolic hat-tip to the culinary arts, not a usable part of the day-to-day action. 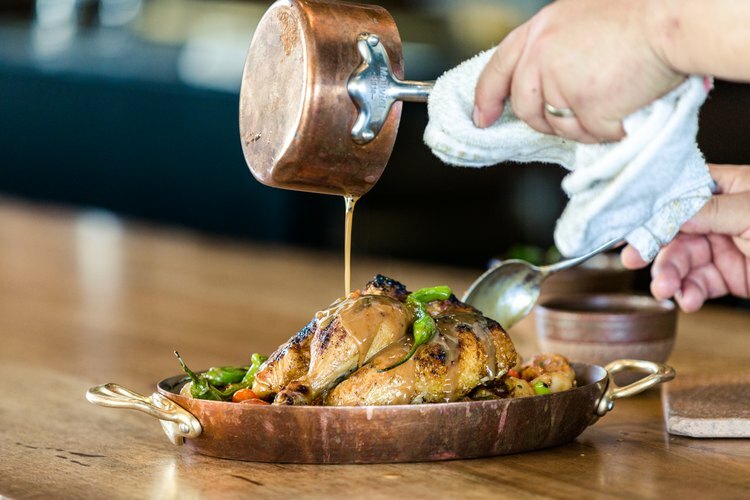 So when a seemingly decorative duck press is pulled down from its shelf to be used in Otium's kitchen, it's your first indication that the downtown-L.A. restaurant is going for something very different — both with its food and its design. 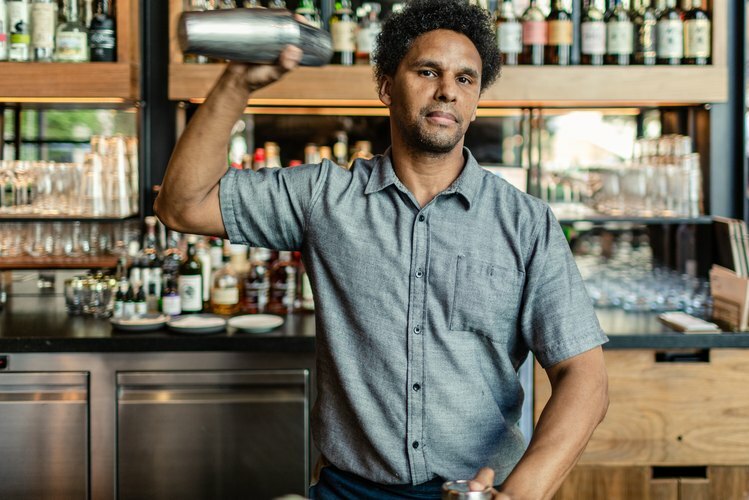 "What you do every day is beautiful," Otium's chef and owner Timothy Hollingsworth says of his profession. "There's no need [to hide] what we do in the restaurant industry behind closed doors." 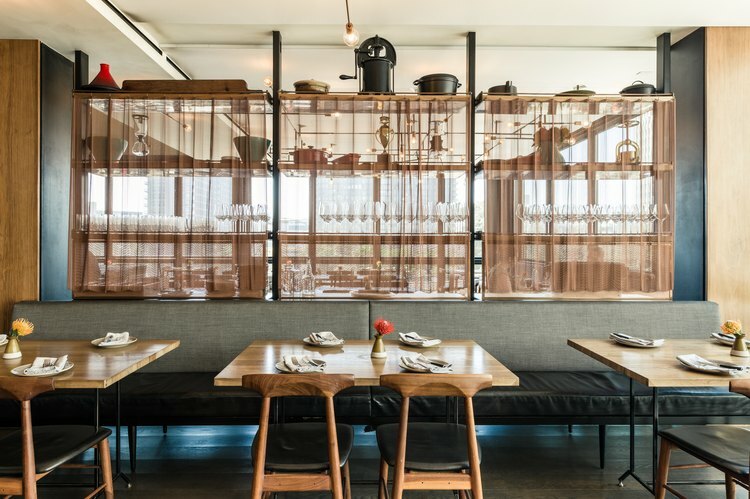 And Hollingsworth's vision, a marriage of the functional and transparent, is fully embodied by the space: Almost all the gadgets, dish ware, and glassware (much of which comes from local artisans) lining the open kitchen's shelves are put to use either in creating or serving the eatery's food. It's more reminiscent of a (ridiculously chic) residential kitchen with open shelving than a restaurant. 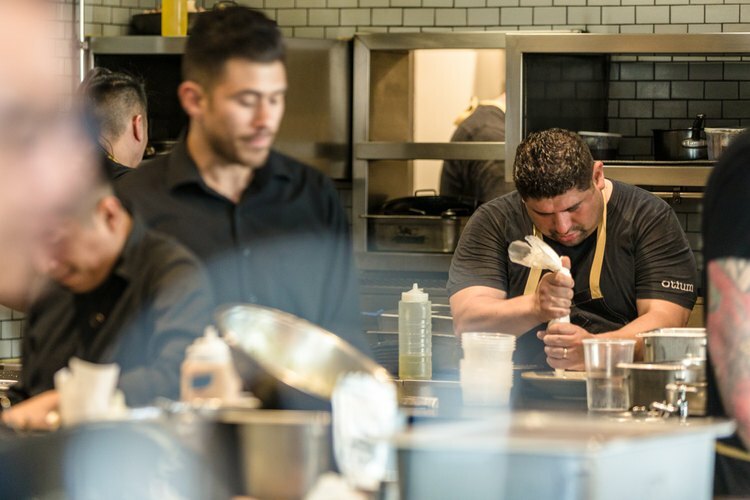 Prior to opening Otium in 2015, Hollingsworth had worked at the legendary French Laundry in Yountville, California for 13 years. 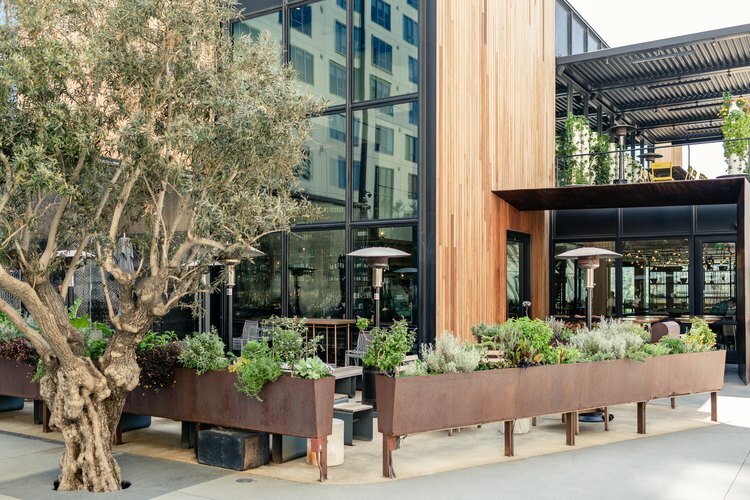 He was then tapped by the Eli and Edythe Broad Foundation to create a restaurant next door to the nearby Broad museum — in lieu of an in-house restaurant — in downtown L.A.
First came Hollingsworth's concept for the restaurant, and next came House of Honey, the interior design firm which brought it to life. 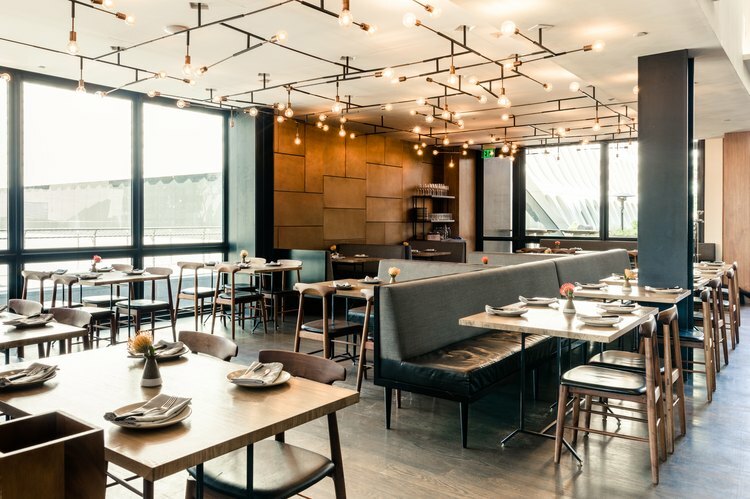 In collaboration with architect Osvaldo Maiozzi and interior design firm Studio Unltd, House of Honey's creative director Tamara Honey got to work uniting Hollingsworth's vision for the food with the aesthetics, ultimately landing on "sophisticated rusticity" as the desired look. The build relied on basic, natural materials — steel, glass, copper, stone, lots of wood — and muted colors to create a space that's bright and airy, but at the same time grounded in earthy tones. 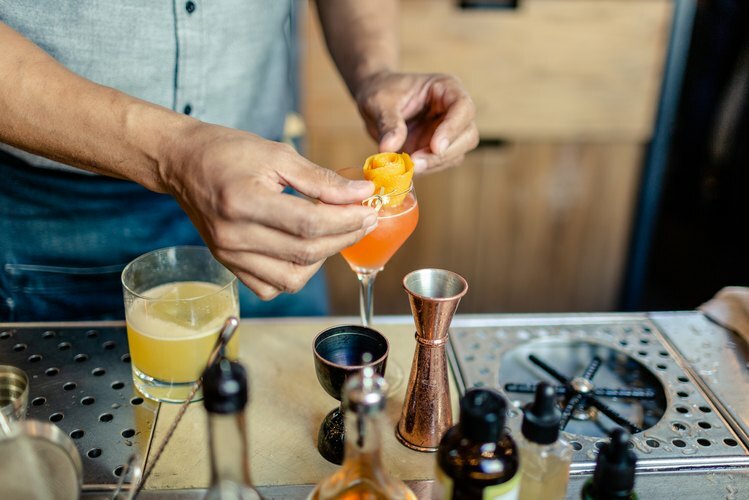 "It was important to create different zones or areas and I accomplished this through a variety of seating options including communal tables, casual lounging areas, and a generous bar." Hollingsworth wanted a social restaurant where guests would feel like they're at a dinner party in his home. 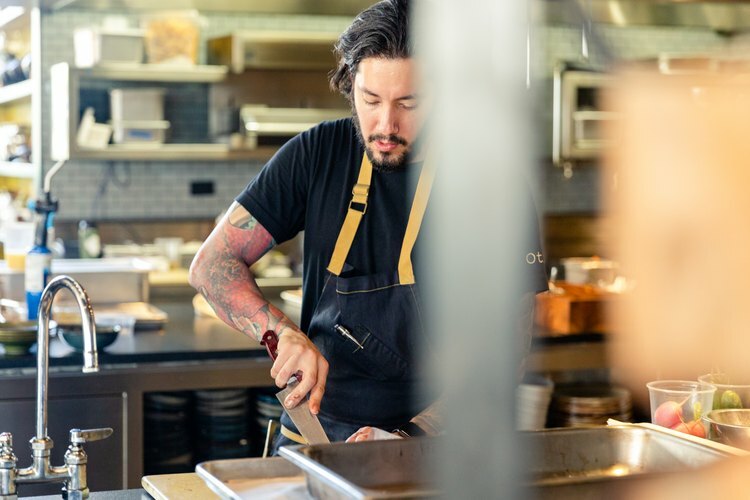 At Otium, he invites diners to come into the kitchen to pick their own cut of meat or chat with the chefs. 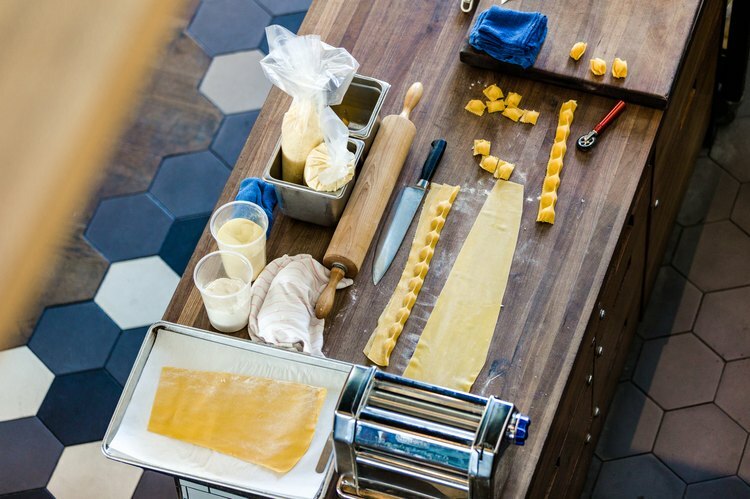 There's also a prep station in plain sight where you can watch as pasta is crafted and whole animals are butchered. 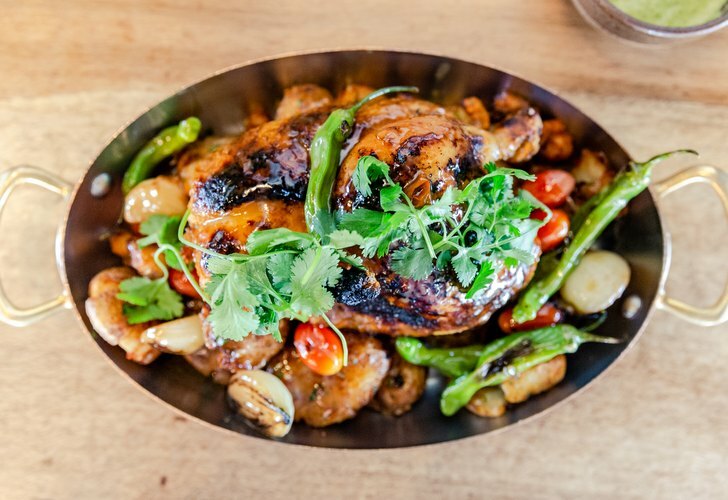 All this adds up to a tantalizing menu that includes dishes like scallops with summer squash and prosciutto, hamachi with ponzu granita, and the exceedingly popular chicken with potatoes and shishito peppers that arrives in a large copper dish, served family-style. "We're doing Angeleno food," Hollingsworth says. "A modern take on what America is today and what Americans are eating. It came from the idea that there are so many different cultures around us." Hollingsworth was intent on supporting local artisans in the process of designing his eatery. The chairs inside and out are by North Hollywood furniture maker Chris Earl. 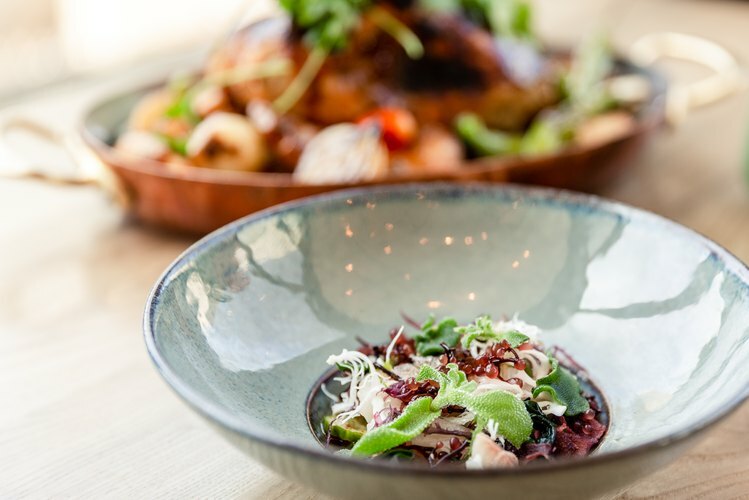 Food is served on mixed-and-matched ceramics from Los Angeles–based Irving Place Studios, who also furnished the vases on the tables. "You feel the passion for what [ceramicist Sabrina] has with her craft and that inspires me," Hollingsworth said. And the flowers? Sourced from the nearby flower market. 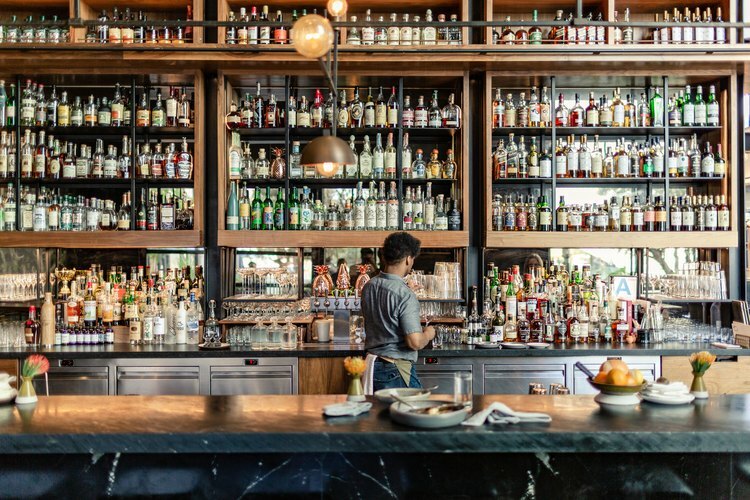 The stunning centerpiece of Otium is its bar, made of Brazilian soapstone and featuring towering tiers of liquor storage that form an arresting functional collage. 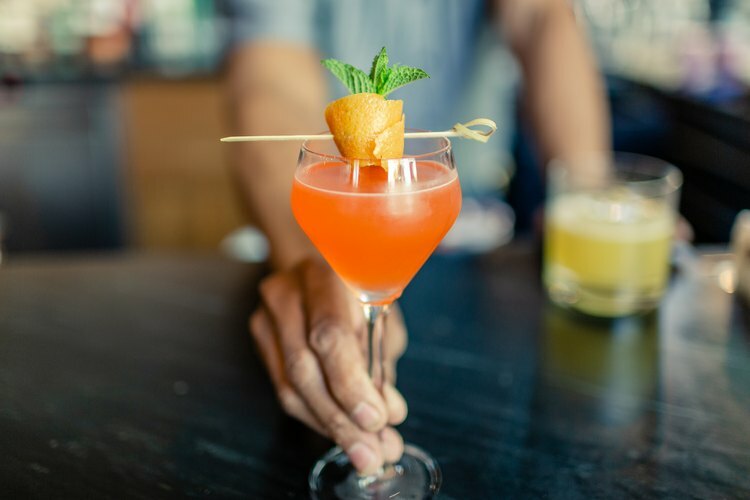 Guests can enjoy unique cocktails ranging from a spiked Saffron Lemonade to a Fig Leaf Old Fashioned. 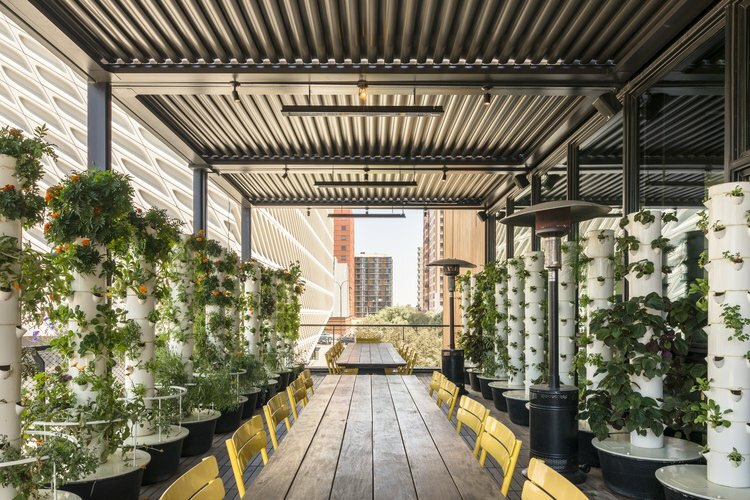 Upstairs, in an outdoor space reserved for private events, you'll find an impressive free-standing garden comprising 27 vertical towers from LA Urban Farms, housing 40 plants each. Their herbs, vegetables, and edible flowers are clipped before and during service to be used in the restaurant's dishes. 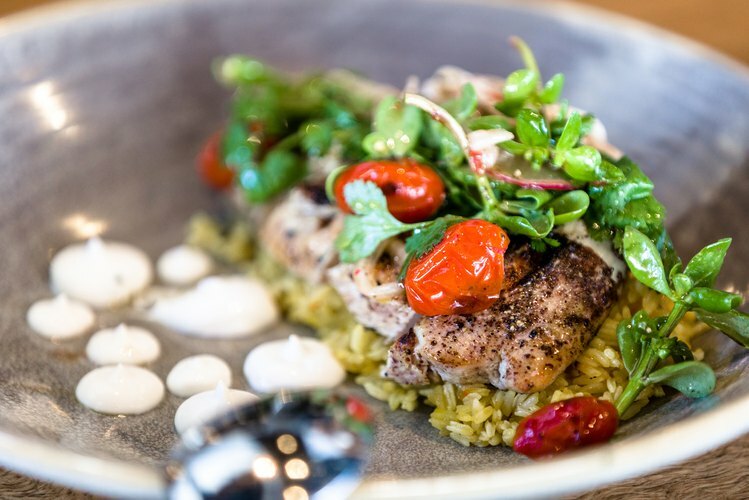 It's rare to find a restaurant where the experience of eating is incorporated into every aspect of the look and feel of the space, too, but Otium delivers. 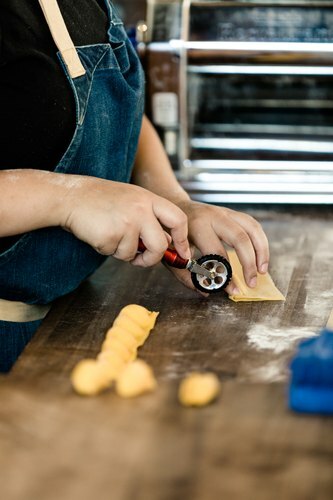 It's all about the food — but as it turns out, there's decorative value in all that it takes to assemble a delicious meal.